HarQen's digital interview platform allows you to hire quickly and efficiently without sacrificing quality. 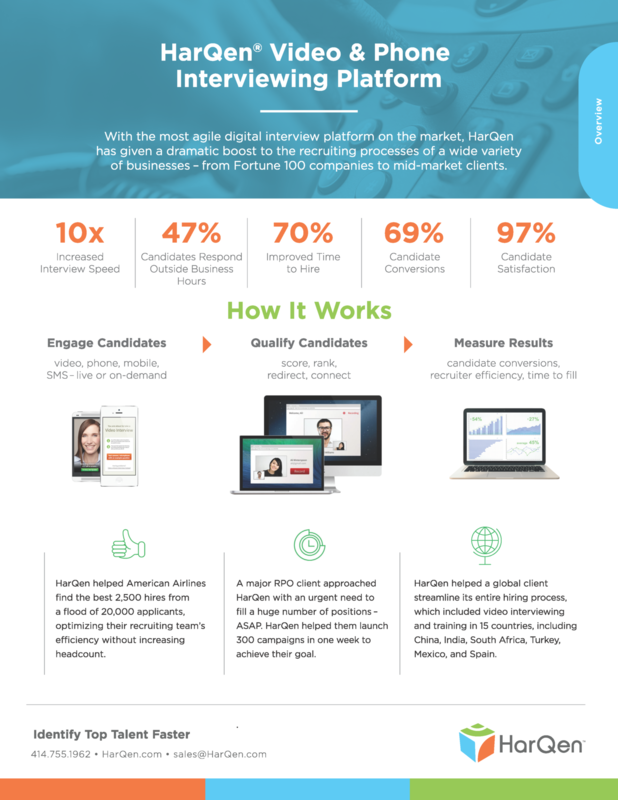 With on-demand phone interviews, on-demand video interviews, on-demand SMS, and web and live video interviewing that are mobile, global and reliable, HarQen allows your recruiters to design and customize the interview experience. HarQen’s digital interview platform, Voice Advantage, is the most diverse and reliable solution on the market. HarQen’s on-demand phone interviews, on-demand video interviews, on-demand SMS interviews, web and live video allow your recruiters to hire quickly and efficiently without sacrificing quality. Global clients depend upon HarQen’s ability to deliver custom, pre-designed interviews in the medium to meet the needs of their diverse set of candidates. Your message, your brand, your interviews, all in a web-based interview platform that is mobile optimized. On-demand phone interviewing has never been more necessary than in high-volume recruiting. Customize and design a phone interview experience with your message, your voice and your screening questions. Quickly identify top talent and share interviews directly with a hiring manager. On-demand phone interviews may be triggered immediately from the application, via email invitation or through social media add-on. On-demand video interviewing allows your recruiters to gain a clear picture of your candidate’s professional presence in a customized, and highly efficient manor. HarQen is ideal for evaluating candidates for customer-facing positions, such as those in Sales and Customer Service. 74% of interviews are completed within 24 hours! Now your candidates can differentiate themselves as unique talents, anywhere, anytime, with the most reliable video interview mobile experience. SMS/Text Interviews. Reach Millennials. Mobile, Custom. On-demand SMS/text interviewing is the most advanced digital interview experience on the market. 85% of businesses incorporate SMS into their market engagement. HarQen makes it easy to deploy this technology into recruiting and interviewing. Quickly qualify talent through SMS questions and if needed, pivot directly to an on-demand phone or video interview. HarQen's digital interview platform, Voice Advantage, is the most diverse and reliable solution on the market. HarQen's on-demand phone interviews, on-demand video interviews, on-demand SMS interviews, and web and live video allow your recruiters to hire quickly and efficiently without sacrificing quality. Global clients depend upon HarQen's ability to deliver custom, pre-designed interviews in the medium to meet the needs of their diverse set of candidates. Your message, your brand, your interviews, all in a web-based interview platform that is mobile optimized. On-demand phone interviewing has never been more necessary than in high-volume recruiting. Customize and design a phone interview experience with your message, your voice, and your screening questions. Quickly identify top talent and share interviews directly with a hiring manager. On-demand phone interviews may be triggered immediately from the application, via email invitation, or through social media add-on. On-demand SMS/text interviewing is the most advanced digital interview experience on the market. Eighty-five percent (85%) of businesses incorporate SMS into their market engagement. HarQen makes it easy to deploy this technology into recruiting and interviewing. Quickly qualify talent through SMS questions and, if needed, pivot directly to an on-demand phone or video interview. On-demand video interviewing allows your recruiters to gain a clear picture of your candidate's professional presence in a customized and highly efficient manor. HarQen is ideal for evaluating candidates for customer-facing positions, such as those in Sales and Customer Service. Seventy-four percent (74%) of interviews are completed within 24 hours! Now your candidates can differentiate themselves as unique talents, anywhere, anytime, with the most reliable video interview mobile experience.